When Todd and I got married fifteen years ago (whoa! ), I had a thing for Danish design. 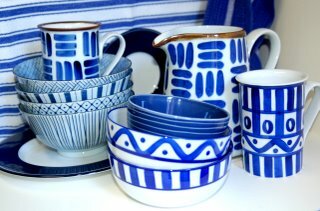 I fell in love with some Dansk blue and white dishes, which were the most expensive thing on our registry. We had just graduated from college, and we needed everything for our first apartment and our big move to New York. I knew we wouldn't have much space in a city apartment, so these dishes would serve as both our everyday and our special china. We were young and hadn't really established our own personal style, and I wondered if we would still like our choice when we were a little older. 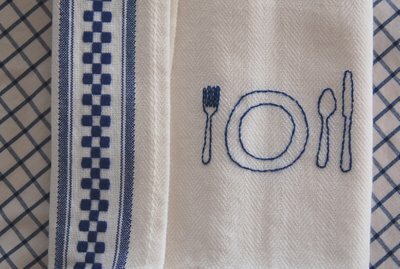 I'm pleased to say I still love the dishes, and I'm still grooving on the blue and white color story. I've gradually expanded our small dish collection to include other blue and white pieces, especially the inexpensive Japanese dishes I get at Pearl River Mart. And I still love Danish design but enjoy a more eclectic look at well. 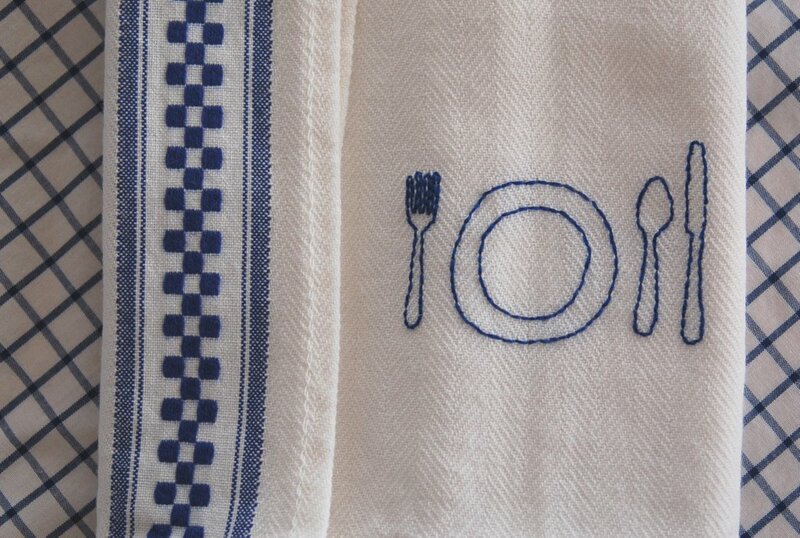 Thus the blue and white sashiko placemats I picked up when we were in Tokyo a few years ago. 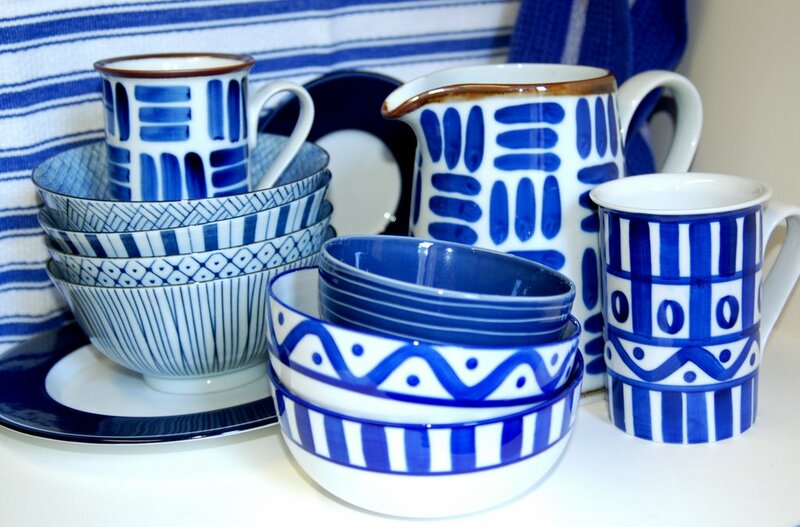 Eventually I'd love to have a blue and white kitchen; but we've nearly outgrown our little one-bedroom rental apartment, so those plans will have to wait until the next place we live or until we buy an apartment and it makes sense to redecorate it. 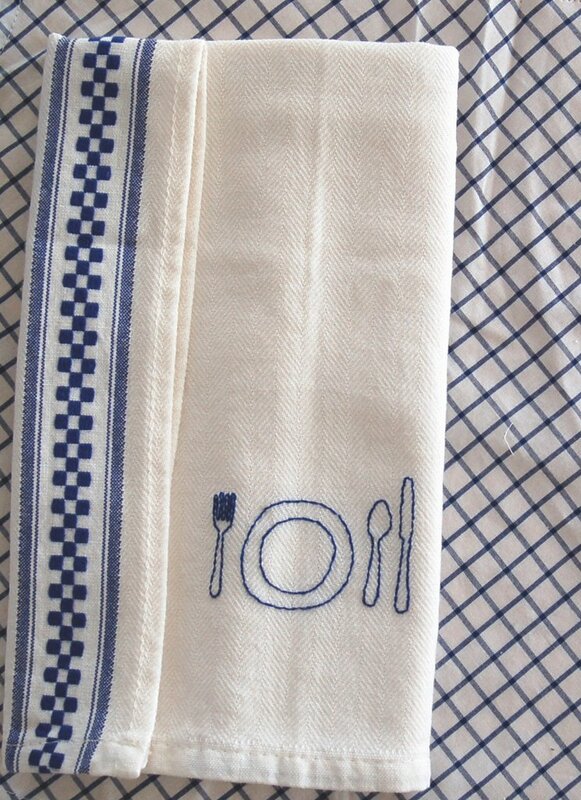 Meantime, my blue and white obsession is limited to portable things like our dishes and table linens. Amy has been doing a redwork thing; I guess I'm doing bluework instead. In any case, I made four of them--just enough for a cozy dinner in our smallish dining room. Any more than four people starts to feel a little too cozy. These are our new dinner napkins made from dishtowels, a la an old issue of Martha. She monogrammed hers; I'm really not a monogram sort of girl. 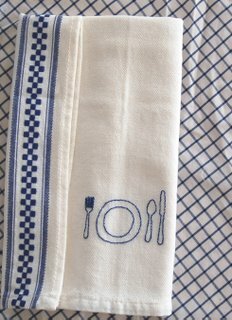 I'm more the sort of girl who can't remember which side of the plate the forks goes on, so my embroidery will help me to set the table. Maybe it will help Little to remember when she helping out someday, assuming I'm ready to risk letting her handle those dishes of ours. After all, I'll probably still like them in four or five years if I haven't gotten tired of them yet. I wonder if they make similar dishes in unbreakable plastic? 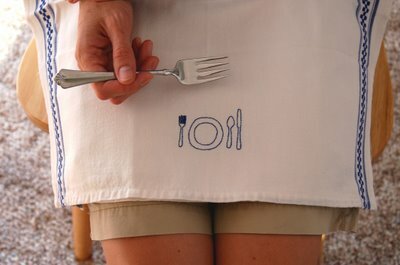 Sweet napkins! 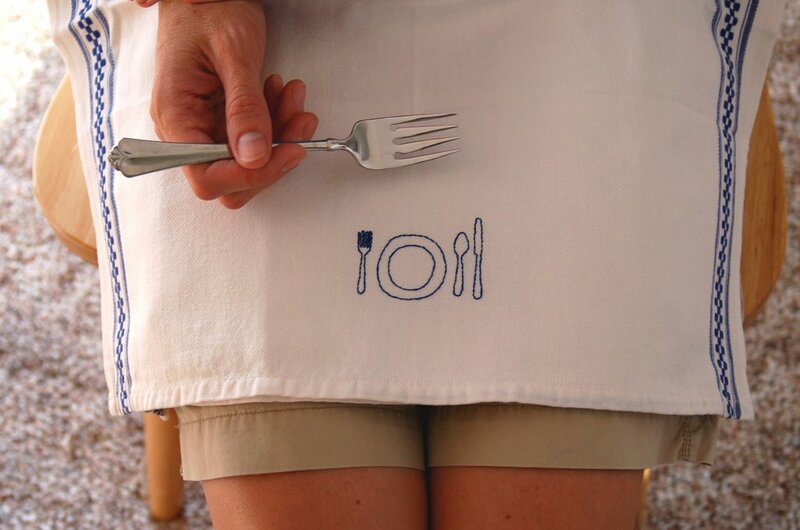 I always love your embroidery style! 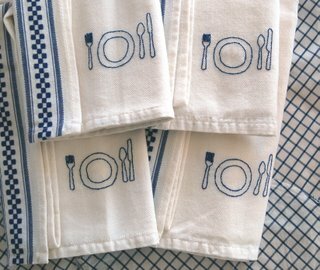 I like the blue and white theme, your napkins turned out beautiful. Simple and charming. very cute. i just did some red- and bluework (the Stitchettes from Wee Wonderfuls). i was surprised how much i like the monotone. more are in my future. these are really lovely - shame to get them dirty!